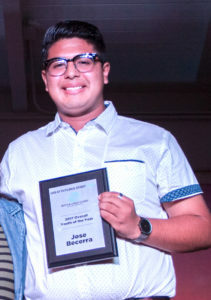 A big congratulation goes out to Jose Becerra, a 17-year-old Club teen at our La Colonia Clubhouse located in Solana Beach. It was the summer of 2007 and I was a 7 year old boy looking forward to having an amazing time at the local park. Little did I know that I would meet a very special person at the park that day by the name of Raul Castillo. Raul, started an after school program at La Colonia Community Center through Boys & Girls Clubs of San Dieguito that would shape my well-being and change my life completely. Thanks to Raul, I now had a place where I could color, play, be myself and have fun with my friends. I fell in love with the La Colonia Club the very moment I stepped foot in the door. The Club has given me the opportunity to experience so many firsts. My first bike, first pair of shoes, first soccer ball, first Christmas, first pair of cleats and the first place that I call my second home. Another amazing opportunity the Club gave me last summer was a paid internship with DPR construction. Because of this experience, my knowledge of the construction industry has expanded beyond just nails and hammers. I now know some of the ins and outs of planning for a new construction project. I know what it feels like to work out on a construction site, how it feels to pour concrete to hold up a parking garage at a mall and so much more. My goal after high school is to attend Chico State and major in construction management. Had I not had this wonderful opportunity with DPR, I would have never found my vocation. The staff members, volunteers and everyone else at the Club are people I consider my second family. They work at the Club not for the money, but because they care about every single student here. I know that the staff at the Club go through struggles of their own, yet they never hesitate or think twice about being there for me when I am going through a difficult time. I trust the staff and know that I can go to any of them when I need to talk about my feelings or my struggles. They listen with open ears and an open heart. These past 10 years at the Club have been the greatest years of my life. It has shaped me to be the person I am today. The Club has motivated me to keep working on my studies because graduating from college will help me ensure a good life for my family. Most importantly, the club has taught me to live life the best way possible and to make a positive impact on the world and change the lives of others just like Boys & Girls Clubs of San Dieguito created a change in my life.